They're big. They're bad. 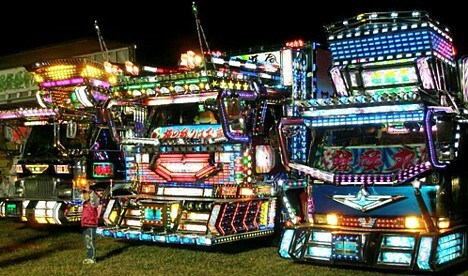 They're dekotora ("decoration trucks"). Explore some of the internet's best dekotora photo collections here: Link 1, Link 2 (third button down, on the left), Link 3, Link 4, Link 5, Link 6, Link 7. And for a small dose of dekotora history, check out this intro to one of the Torakku Yaro ("Trucker") movies, the 10-part series released by Toei in the late 70s that spawned Japan's dekotora boom. Been waiting for galleries of these for awhile. Killer man, just killer. You have done a great job getting this together. I always search for them but cant find em. You should put up some pics of the Custom VANS they do also. You have done such a good job getting this together, Maybe you could pull off the Van thing to. Some of the vans with the big fiberglass wings and what not. is there any sale on net for those nice deoc fix on trucks? Does this truck can realy works ? In Japanese DEKOTORA is ???? In Japan, these tracks are really used for normal transportation works. I will probably build one of these to tow my rx7 show car one day.!! hi there, can we link? i am so interested with dekotora, we have too a less lavish but similar version of dekotora..my link as above. i''l link u up! DH Publishing http://www.dhp-online.com has a photo book of deckotora coming in out in spring. Check it out at their website. 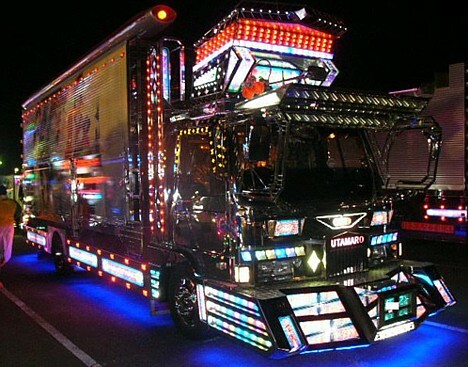 I�m looking for a contact, to buy the pictures of the decorated trucks. Can anybody help me? Hey.... japanes duds thank you for creating the dekotora trucks their becoming more popular heir in the philippines were even starting to create our own and pink tentacle thank you for the photos hop you add more. keep on rolling dekotoras....!!!!!!!!! 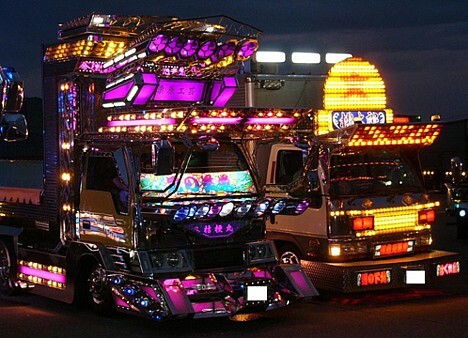 there are a few trucks decorated just like that in sg but, due to the restriction and some safety issues, the trucks here are far from the one we see in japan. still, there are no decolimits for some.... cheersss!!!! 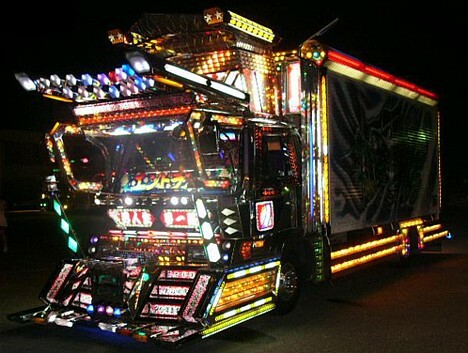 There is a magazine called The Truckers Bible which features the "street fashion" equivalent of deco-tora. Street fashion magazines go around taking pictures of fashionable people on the streets of Tokyo (and all around the world). 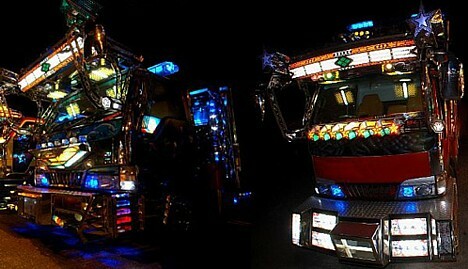 Truckers Bible takes photos of decorated trucks on the streets of Japan. They also recently did a special on Truck Guys since the second - Kinya Aikawa - of the two lead actors died this year. Do drivers decorate their trucks in other countries? What keywords should I google to find out? Neatorama » Blog Archive » Pimp My Semi. aspiration. » Pimp My Semi.